DOT Compromises on In-flight Cell Phone Ban: Yes, to Phone Calls. No, to Oxygen Masks. (WriteGoodWire Services) Airplane passengers might soon win the right to make in-flight calls provided that airlines are permitted to eliminate “frills” such as oxygen masks, lighting and, in certain cases, wings, according to a deal hammered out by the Department of Transportation. The compromise comes on the heels of a Federal Communication Commission vote to consider ending a ban on in-flight phone calls. Under current restrictions, flyers are forbidden from making calls between takeoff and landing unless they are A-List celebrities. “New technologies have dramatically reduced the threat that cell phones pose to commercial airliners,” explained Capt. Rocky “Ace” Butane, DOT chairman. “Used to be that a phone’s autocorrect feature would cause landing gear bolts to unscrew. However, today’s sophisticated mobile devices can do little more than open micro fractures along the fuselage. 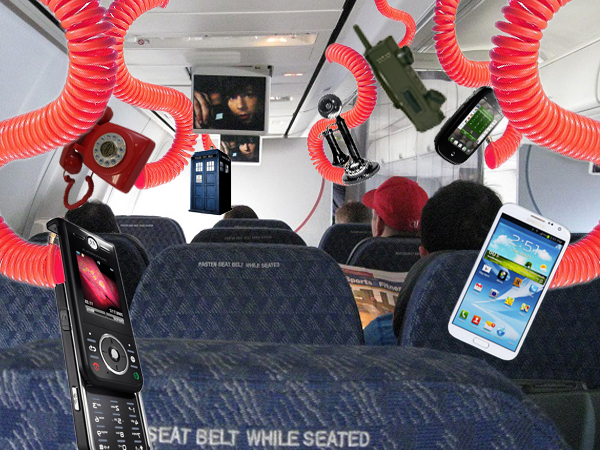 Replacing oxygen masks with phones a win-win for the airlines industry, except in an emergency. Although on-flight phone usage has been an option much sought by flyers, consumer groups offered mixed reactions to the announcement. “As a loud, obnoxious Oklahoman who chews with his mouth open and calls women ‘girlie’, I welcome the opportunity to disturb a wider range of complete strangers,” said Leo Pinterest, chairman of Annoying Pricks United. “Bwah-HAH! Hyuk! HYUK! Am I right or am I right, girlie? (Buuurp! )” he added. But it’s the reshuffling of safety priorities rather than gossipy passengers that concerns one frequent flyer who asked to be identified only by her ringtone, Beyonce’s Love on Top.